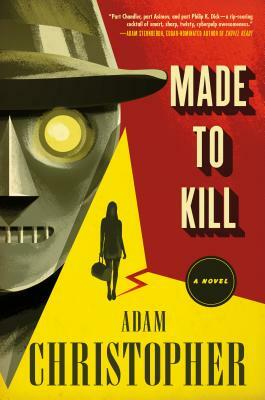 New Zealand-born British novelist Adam Christopher (Empire State, The Burning Dark, Seven Wonders, and Hang Wire) is making a rare US appearance at Chapel Hill’s Flyleaf Books this Saturday [Facebook] to read from his forthcoming novel Made to Kill, which begins his new “L.A. Trilogy” from Tor Books: “Set in Hollywood 1965, Made to Kill is very much a noir mystery, except that the detective is a robot (with a heart of gold) and his Gal Friday is a supercomputer with a Lucille Bluth sensibility. The novel was born out of short story written for Tor.com called “Brisk Money” whereby the author imagines an undiscovered sci-fi novel written by Raymond Chandler.” Joining Christopher in conversation will be Durham author Mur Lafferty, who also took the time to ask Christopher a few questions about juggling genres and projects. Do note the start time for Saturday’s event is 6 pm as opposed to the usual 7 pm, and! There will be wine and snacks, and with both Lafferty and Christopher, it’s sure to be an entertaining time. I’ll see you there! And do check out the fantastic book trailer over at Tor.com, and if you’re reading this from further afield, you might want to check out the official L.A. Trilogy website for the other remaining events on his tour. Q: Your work is heavily entrenched with American Noir elements. How long have you been a fan of the genre, and what made you want to write your own twist? I love mystery and crime fiction, and in particular the hardboiled and noir varieties. I’m a huge fan of Raymond Chandler in particular, and I knew that he wasn’t too keen on sci-fi – but at the same time, I thought that a Raymond Chander SF novel would be really interesting. My editor kinda challenged me to write it, and that became the novelette “Brisk Money”, and from that, I suddenly found myself with a whole trilogy of books about a robot detective who is really a robot hit man. This kind of genre mash-up is a lot of fun to write! Q: You’ve had a very busy year, with novels, tie-ins, and comic books. How do you structure your schedule to handle these projects, and how do you keep so many stories straight in your head? It’s kinda interesting that with comics, because they are a different form of writing, something close to a screenplay, I’ve found that they occupy a different brain-space to writing prose. So switching between books and comics is a lot easier than I thought it would be, which is great, because as you say, I’m busy! But I’m very lucky to be able to work on different projects, and it’s really just a case of hitting my daily word counts (or page counts for comics) and keeping on top of it all. Deadlines are rather good for motivation! And even among my novels, they are different kinds of stories, which really helps with keeping everything in order. Q: Speaking of all your projects, with noir (Made to Kill), Holmes mystery (your Elementary tie-in novels), superhero (The Shield comic book, and the novel Empire State), and space horror (The Machine Awakes) as just some of your genres, which do you feel most comfortable writing? Which genre haven’t you written in that you would like to try? Noir/mystery/crime I think are my favourite genres, and the great thing about them is that they mix really well with science fiction and fantasy. Elementary was really interesting as that was my first completely straight crime mystery story, with no sci-fi or fantasy at all – that’s something I want to do more of. And I’ve also got some ideas for a big action thriller, which should be a lot of fun. Watch this space! Adam Christopher is a novelist and comic writer, and award-winning editor. The author of the forthcoming Made to Kill, volume 1 in The LA Trilogy, Adam is co-writer of The Shield for Dark Circle Comics and author of the official tie-in novels novels based on the hit CBS television show Elementary. Durham author Mur Lafferty has won the John W. Campbell Award for Best New Writer, is a two-time winner of the Manly Wade Wellman Award for her novels The Shambling Guide to New York City and Ghost Train to New Orleans, and is a member of the Podcasting Hall of Fame. Her latest fiction appears in the Serial Box serial fiction series Bookburners and her next novel, Six Wakes, is due out from Orbit in 2016. Her latest project, editing the new Escape Artists ezine Mothership Zeta, launched on Halloween. This entry was posted in Coming to Town and tagged adam christopher, flyleaf books, made to kill, mur lafferty. Bookmark the permalink.